From Wallula Gap to the mouth of the Columbia is some 310 miles. 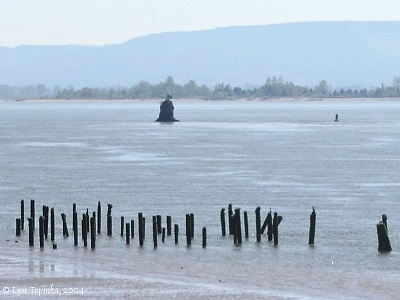 While the rock of the gap is, for all intents and purposes, a solid and enduring landmark, the mouth of the river is not. 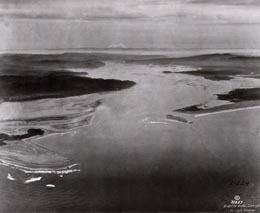 River mouths are fluid constructs and defy fixed positions. As an aid to navigation, River Miles are begun at a somewhat arbitrary mile 0 point. In the Columbia's case, RM 0 begins just beyond the North Jetty and extends perpendicular to the dredged channel. Shifting sand and fast water makes for change. So the position of the mouth is determined to be somewhere between Cape Disappointment in the north and Point Adams on Clatsop Spit in the south. As the Corps of Discovery came ever closer to the river's end, all the men were filled with anticipation. The weather was horrid. Incessant rain and strong winds from the southwest kept them wet through. No matter, William Clark sat stolidly in his canoe keeping a notebook wrapped in oil skin perched on his knee. This served as his log of the voyage and in it he recorded courses, bearings, prominent landmarks, and, on occasion, exclamations. On November 7, 1805, he made this entry in the log: "Ocian in view! O! the joy." Though the emotion was no doubt genuine, his observation was to prove false. 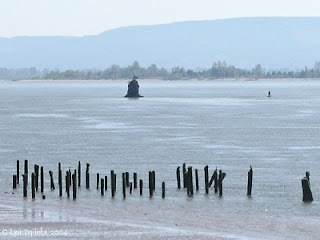 He made that observation from an exposed campsite of rock and rolled logs near Pillar Rock, "... a rock Situated half a mile from shore, about 50 feet high and 20 Deamieter ..." The "ocian" is still around the bend and some 15 miles away. No doubt the rough water of the lower river looked very like ocean. The view downriver rarely allows much of a distinction between fresh river water and the salt of the Pacific. The low lying sandy spit extending out to Point Adams confuses the most discerning eye. And the width of the estuary as it tends seaward is enough to add to that confusion. Waves and swell blend and merge. It would take an experienced eye to say that there the river ends and there the ocean begins. A distant horizon would be suggestive on those days when wind and rain and fog allows a distant horizon. 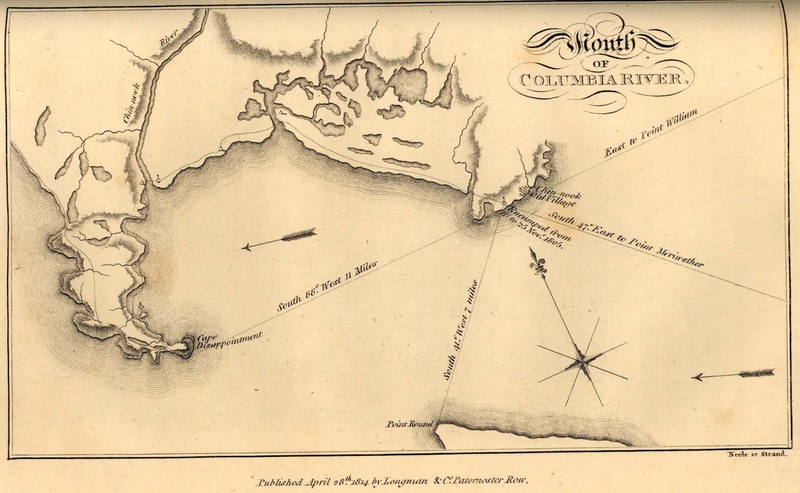 George Vancouver, charting the coast in 1791, missed the river as well. He did conclude that a small bay or river might exist. He was contending with fog, rough weather, and an unruly crew of young gentlemen at the time so might be forgiven his lapse. 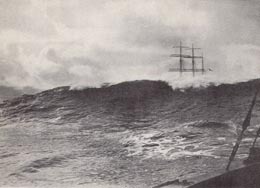 It was left to Robert Gray to first cross the bar and enter the estuary. 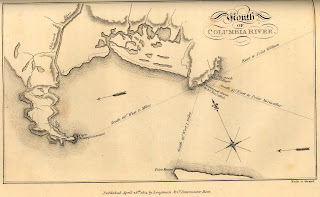 He sailed up river as far as Tongue Point (RM 19), traded with the natives (his primary concern), and named the river after his ship, Columbia Rediviva. His report (and subsequent profit) led the parade of trading vessels that were to follow. Since Gray's crossing more than 2000 large ships of been wrecked on the bar earning it the sobriquet of The Graveyard of the Pacific. I mentioned earlier there are places on the river that afford a view much like that of Lewis and Clark, and one can take from such views a taste of 1805. But the Columbia of today, controlled by dams, bridged, overfished, and polluted is certainly not their river. Estimates of 19th century fish runs count 12 to 16 million fish. This number has been reduced to a million or so. Take a stadium filled with 72,000 people and, using the most lowest estimate past runs, reduce that crowd by the same ratio. 6000 people would remain. One might say that the stadium was empty with such a sparse crowd. And so the river. Modern homo sapiens seem driven to dominate the natural world, and our overbearing presence has created today's Columbia River.